Chocolate Gateau - Shown in the cover photo. Coffee Cup Cake - probably could be knit in the round to avoid as much seeming. Very Cute. Birthday Cake - Shaped like a small square ice cream cake. There is even scalloped frosting and a candle! Swiss Roll - Simple, knit two rectangles and roll them up. But man do I have a craving for these things now. Complaint #1: The actual yarn brands used are not mentioned. 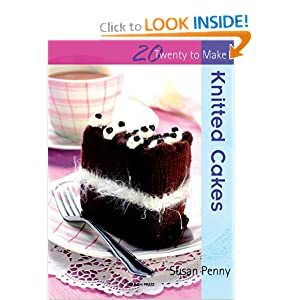 I have a feeling that for some of these patterns, the yarn type makes a lot of difference with how the cakes come out. Complaint #2: The patterns are not as elegant as they could be. There is a lot of sewing pieces together. There are rows that say something like "knit, increasing 2 sts randomly on each needle." Why not just give a row and say where to make the increases? Complaint #3: When flipping through, you see some fun beadwork. When you look closer, you realize that these are all sewn on after the fact. "Decorate with seed and bugle beads"
There is not a "how to knit" section in this book, so don't use this as your first knitting reference! This will, however, make a great novelty gift for your favorite knitter.